I’ve setup AMP to make sure website content is available on mobile devices lightning fast (Learn more). 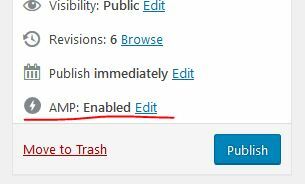 Install AMP for WordPress plugin. Fix issues using Google Search Console. For example, I had to fix minor HTML issue in one of the posts – there was an extra closing HTML tag. Another post was missing featured image. 1 Pings/Trackbacks for "How to Setup AMP (Accelerated Mobile Pages) in WordPress"